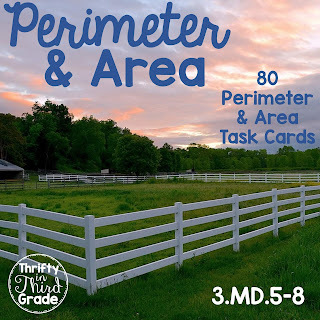 This Perimeter and Area task card includes 80 task cards aligned with Common Core Standards 3.MD.5,.6,.7,.8. The task cards are a mixture of pictures and word problems covering many different perimeter and area skills. They include practice with missing sides as well as rectilinear shapes. These task cards are a fun way to practice perimeter and area skills without giving your students worksheets. There are a lot of different games you can play in your classroom with any set of task cards! Check out the pictures below and head to my store to see the full preview!